This is the Spain Training Kit shop at Soccer Box. This is the place to be if you are shopping for Spain training wear. We also stock the latest Spain home and away football shirts that perfectly compliment the teams training kit collection. 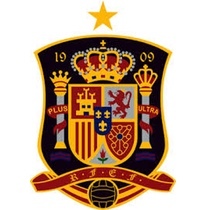 Adidas is the supplier of all the Spain football jerseys, training kits and related accessories and merchandise. The Spain training kit has been exclusively developed by Adidas for the team’s pre match training schedules, warming up on the football pitch as well as for giving interviews and travelling. Not only can you shop for the latest Spain football shirts you can also order some of the Spain training gear collection. This range is ideal for fans of all ages, and can be worn on the football pitch if you enjoy a kick-around, or to show your team loyalty when watching the match. Shop for Spain Football Training Kit with Express and Worldwide Shipping Options for Your Convenience! Adidas is a German sportswear manufacturer. When developing the Spain football and training kits they utilize the latest sport science technology to ensure that they perform well on the football pitch. ClimaCool is an Adidas trademark technology that is used throughout all of the Adidas football kit ranges. The ClimaCool fabric works alongside the skins natural cooling mechanisms to help allow the skin to breath and cool. Mesh inserts are included into the design of the Spain kit, this increases airflow to cool and freshen the skin, and excess moisture is absorbed preventing the skin from feeling clammy and hot. The Spain football players benefit from the technologies used within their football and training kits and now you can too. The products in the Spain football training kit range are not only functional but also look stylish. Wear your Spain training gear on the pitch for football practice, or for training at the gym. Or simply wear it every day as a comfortable and stylish way to show which football team you are supporting. The Spain training kit range perfectly matches the latest home and away football shirts that are also available in the Soccer Box shop. You could also treat yourself to some Spain football accessories that are perfect for exhibiting your fan loyalty everyday. Use the Soccer Box Secure Online Shopping Cart or Call Our Customer Service Team to Place Your Order Today!